The monster loomed ready over the sprawling metropolis, awaiting the first lesson of the day. His mentor instructed him to unleash a tremendous growl and pump his fists wildly above his head to scare the mass of people gathered below. Taking a deep breath, the monster scattered the crowd and sent the tiny humans fleeing in terror. Further into the lesson, he smashed buildings, swatted down airplanes and, as a final test, battled a skyscraper-sized robot. After receiving his diploma from the Monster Training Center he happily returned to his third row seat beside his parents. This was just one of a dozen virtual worlds presented at this year's Building Virtual Worlds (BVW) show at Carnegie Mellon University. Each year graduate students from the Entertainment Technology Center (ETC) invite students and industry guests to view a presentation of their work. All of the worlds shown are designed, developed and built during a semester long course at the ETC. The ETC brings together students from around the world with diverse academic backgrounds, ranging from art and computer science to business and psychology. I entered the program with an undergraduate degree in mechanical engineering. All students, regardless of their undergraduate major, must take the same four courses during their first semester: Improvisational Acting, Fundamentals of Entertainment Technology, the Visual Story and BVW. 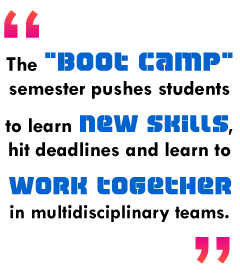 The "boot camp" semester pushes students to learn new skills, hit deadlines and learn to work together in multidisciplinary teams. BVW is the premier training ground for this knowledge and the most challenging course that most students, myself included, have ever taken. Dr. Randy Pausch, a co-founder of the ETC, created the course. Dr. Pausch recently received worldwide acclaim after appearing on Good Morning America and Oprah for his "Last Lecture," where he described how to achieve childhood dreams as he faces his own battle with terminal cancer. In his lecture, Dr. Pausch describes the course "as a way, en masse, to get people turned on to their childhood dreams." Game designer Jesse Schell, former Creative Director for the Disney Virtual Reality Studio, is currently teaching BVW. The class immerses students in an environment where we use our individual skills as part of a group to accomplish things that would be impossible on our own. In these groups we get a chance to experience and learn about a variety of different skills. "If you look at the people who excel in the area of entertainment technology, it's the people who tend to excel in cross-disciplinary work," Schell says.